Today we had the most incredible day celebrating our wonderful friend, Jocelyn. Every detail was meticulously crafted with love. From the chalkboards to the flowers, the waffle bar to the desserts, all in her honor. What a lovely day! This week i worked on 2 pieces for our Environments team. I had actually made one very similar for them last week but on paper so they asked me to recreate it on chalkboards. I thought I would have fun with the project and make a time lapse. Brushes - any would work! This is where you can play around with placement before spending time on the board. If the chalkboard is new, then there is no need to paint. If its had chalk on it before, you will notice it never really gets clean. This piece was actually a cork board so a cork board shouldn't give you any problems. Just try a few coats for cork board! Note: make sure you save some time for it to dry! I like to use Washi tape to lay out a basic structure because it keeps my lines straight and it wont stick to the board too much. This should be a super simple outline and it should be done with a very light hand just to have something to direct you. If you want to make a simple sign that you want to be able to wipe off at some point, then you can use a chalk pen. Note: chalk pens are also great on glass/mirrors, etc.! Make sure to do this with a steady hand. To get this "look" of the thick and thin letters, you need to double all of the downstrokes. So, if you are writing a "J" the trunk down would be thick and the little loop up wouldn't be. Neither would the stick across if you put it at the top. After this, I wipe off the chalk so it's easier to concentrate. 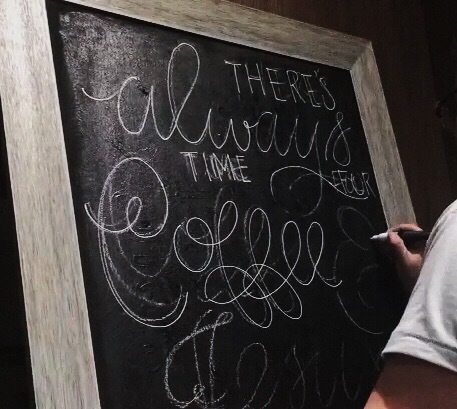 Note: if you're using a chalk marker, wiping it at this point will WIPE IT OFF so you either have to write with the chalk super neat or, wipe around the letters as not too smudge the ink. You can do this with the chalk pen or paint pen as if you were coloring with a marker but I usually go with a paint so it's more vibrant. Once the paint dries, I go over the edges just to make sure everything is straight and smooth. I hope you enjoyed this How-To! Please let me know if you would like me to create a How-To for anything else! Life has been incredible in this season. Every day, I am challenged and growing at work, Vous Church is about to launch this week and Ray and I are completely in love... not to mention I recently found Korean Dramas! With so many moving parts, I don't really get that much time to do calligraphy or hand lettering for fun but with a few client orders coming in, I was able to let go and enjoy! Here are a few of my recent pieces. Free Hand Gold Sharpie on Black Paper with accidental gold splatter! Please let me know if any of you would like to order any of these pieces! I will wrap them up all pretty and get them to you! A few weeks ago I had the privilege of calligraphing about 150 envelopes for our church, VOUS Church; a church plant in Miami. Photography by Emmanuel Hernandez. Materials: Black envelopes, Dr Martin's Bleed Proof White Ink (diluted), Blue Pumpkin Nib, accordion collator for drying, White Gel pen for addressing. The envelopes were closed with a wax seal similar to these. My husband and I moved to Miami in February and its been amazing! One of the tiny downsides of having moved is not having enough time to paint or do calligraphy as much as before but this week I got a chance to do a little something special for my boss' wife. Didn't it come out lovely? Not an original watercolor design but enough to wet my palette! More to come, promise!